Cocotte eggs with Comté: Simple and quick. Creamy Winter Vegetable Soup: Winter vegetables, thinly sliced and cooked in chicken stock, finished with cream and mustard. Crème de foie gras: Foie gras cream and espuma of potatoes. Eggs "en cocotte" with spinach: Ramekins of mushrooms, spinach, cream and egg. Eggs en Cocotte à la Française: Eggs baked in ramekins with peas, bacon and cream. Endive and beer soup: Endive soup with potatoes and beer. Late Winter Soup with Fresh Spinach: Diced smoked sausage and potato with fresh spinach and cream. Ramekins of duchess potatoes: Mashed potato, cooked leeks, bacon and duchess potatoes. Raw beetroot mousse with walnuts: Raw beetroot, chopped walnuts nuts, and spicy mousse. Smoked eggs: Hot egg yolk, smoked mousse, chives and crisp toast finger. The total turnip: All the turnip. Turnip and sesame puree (tahina) soup: Turnips and sesame purée (tahina). Chilli langoustines: Hot spiced langoustines, flambéed in cognac and served with a cream sauce and potato grenaille. Crusty cockle tart: Puff pastry tart with cockles in cream and egg-yolk sauce. Fillets of sole Dieppoise: Sole fillets sautéed in butter with a cream sauce, shellfish and boiled potatoes. Firied fillet of sea bream with polenta: Grilled fish fillet, cherry tomatoes sautéed and creamy cheese polenta. Fish petals, vegetables julienne, and beurre blanc: The best flakes of fish with julienne vegetables . Normandy seafood stew: Julienne vegtables of several kinds and sautéed shelfish in a cream and cider sauce. Rosemary steamed fish: Fish steak with a fondue of shallots. Salmon with sorrel: Tenderness of salmon and slight acidity of sorrrel. Sea bass with coriander cream en papillote: Fillet of sea bass "en papillote" with a julienne of leeks and coriander cream sauce. Spaghetti with mussels and basil: Spaghetti, cream sauce made with mussel juices, basil and Parmesan. Summer Salmon Blanquette: Ceramy salmon casserole with broad beans and mushrooms. Tagliatelle with cockles: Pasta, cockles, spring onion, parsley and cream sauce made with the cooking juices. Turban of sole with langoustines: Rings of sole fillet filled with sautéed langoustines and a cream sauce with langoustine stock. Filet mignon with mustard and tarragon sauce: Medallions of pork filet mignon, cream sauce with tarragon and strong mustard. Involtinis: Small veal and ham rolls stuffed with cheese and parsley. Pork medallions with "full" turnips: Pan-fried pork medallions and turnips, boiled then fried, filled with a green cream made from their tops. Breton leek and mushroom tart: Buttered buckwheat pancakes with a creamy filling of leeks, mushrooms and shallots. Broccoli savoury custard: Creamy savoury custard with broccoli. Cauliflower curry: Cauliflower, curry spices and cashew nuts. Creamy risotto with diced vegetables and flax seeds: Broth rizotto, small vegetables and flax seeds. Creamy spinach and potato gratin: Layers of potato and spinach, with cream and Mont d'Or cheese poured over and browned in the oven. Croque-monsieur complet: Hearty croque-monsieur with ham, made like eggy bread (pain perdu). Filo leeks and cheese tart: Like a crusty leek quiche. French toast "cordon bleu": A ham and cheese 'cordon bleu' sandwich, dipped in beaten egg and cooked like French toast. Fresh spinach with cream: Wilted spinach, cream sauce and hard-boiled eggs. Gratin of Endives with Mont d'Or: Layers of potatoes, endives and cheese. 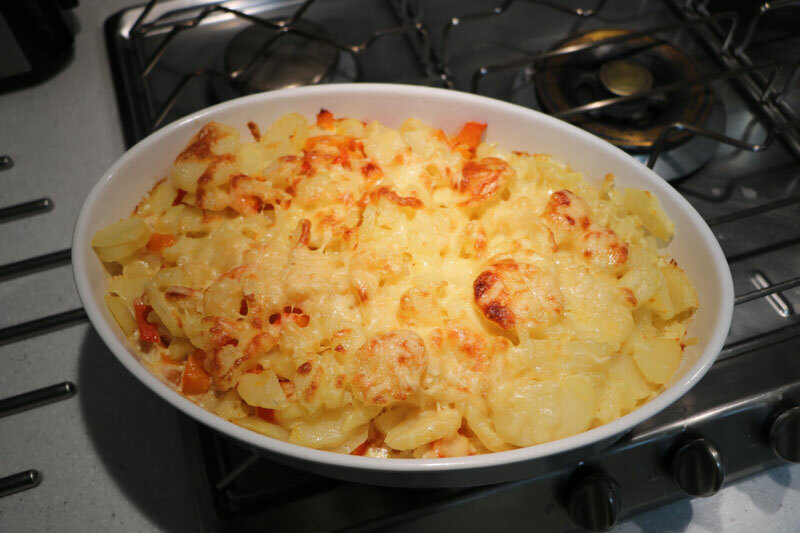 Ham pasta bake: Pasta bake with ham, cream and cheese. 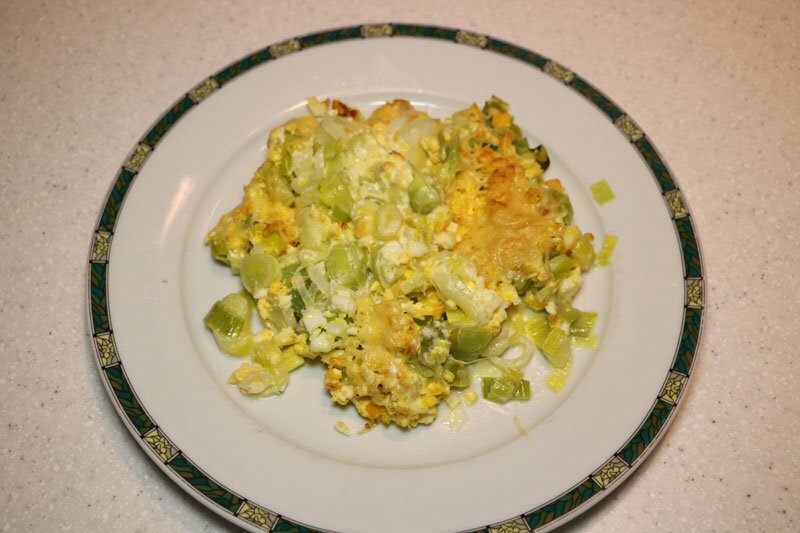 Layered Leek and Egg Gratin : Thin layers of poached leeks and hard-boiled eggs with craem and cheese. 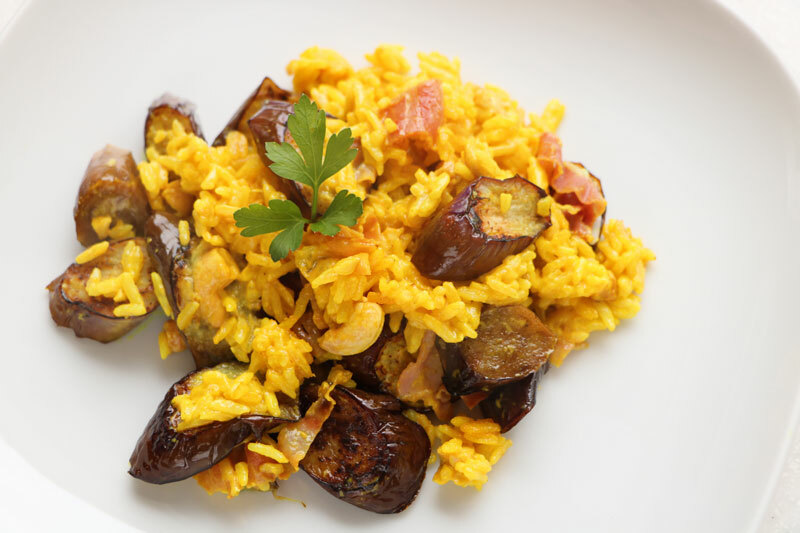 Madras rice: Sautéed aubergines, fried ham and curried rice. 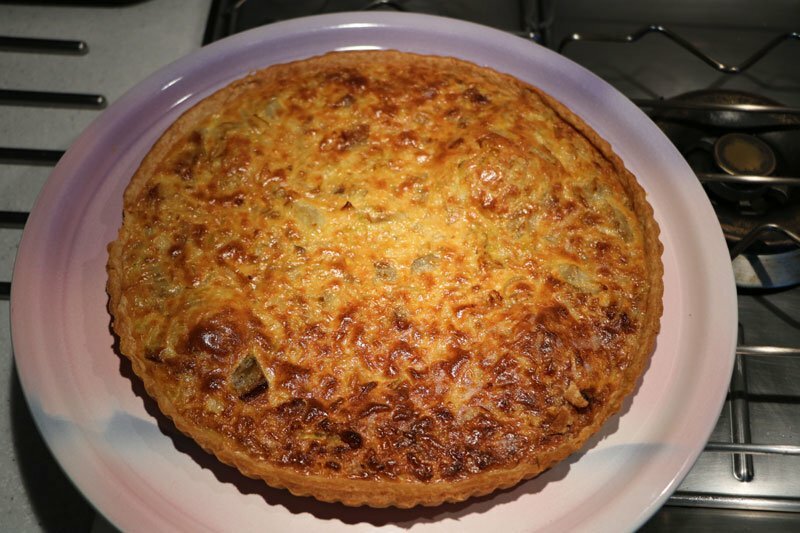 Maroilles cheese quiche: A kind of quiche with leek and Maroilles cheese. Mushrooms on toast, French style: Mushrooms simmered in cream and fried buttered bread. Pasta with mushrooms: Creamy mushroom and shallot sauce with pasta cooked "al dente". Penne with Mushrooms: Mushrooms in a cream sauce and penne. 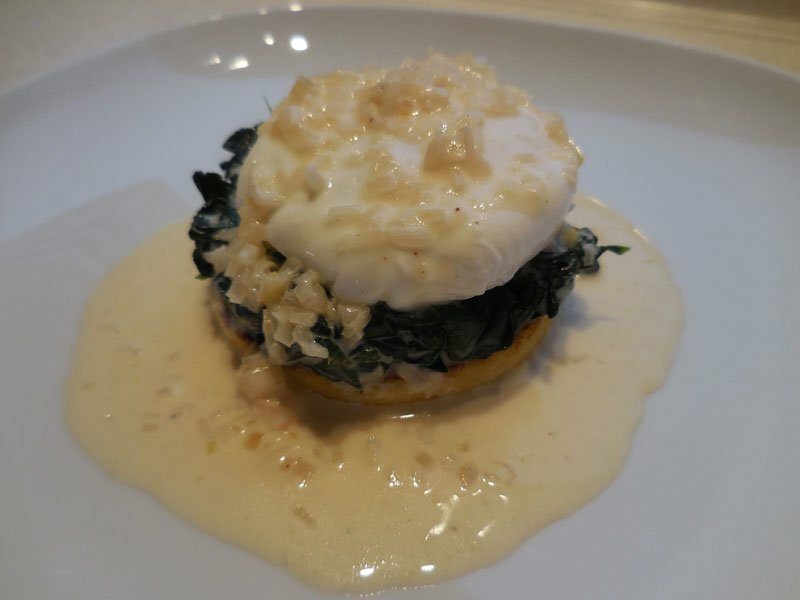 Polenta with spinach and soft-poached egg: Disc of fried polenta with spinach, soft-poahced egg and cream sauce with shallot. Quiche Bretonne: Like a quiche, but with puff pastry and seafood filling. Rustic chicken and mushroom pie: Deep puff pastry pie filled with leeks, chicken and mushrooms. Shallot confit tart: Puff pastry case with grilled cured ham, cream, Epoisses and oven-cooked shallot confit. Spinach and ricotta ravioli: Ravioli with a spinach, ricotta and pine-nut filling, boiled first then baked gratin-style. 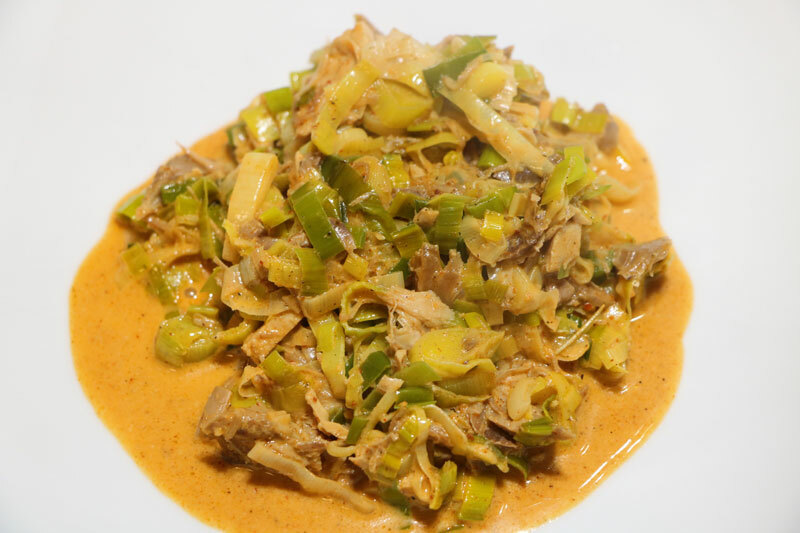 Tandoori-flavoured chicken with leeks: Chicken chunks with leeks in a creamy, tandoori-spiced sauce. Thin endive tart: Tart with puff-pastry, ham, fried endives and light quiche-style filling. Alsatian apple tart: Sweet pastry case, apple slices and vanilla egg custard. 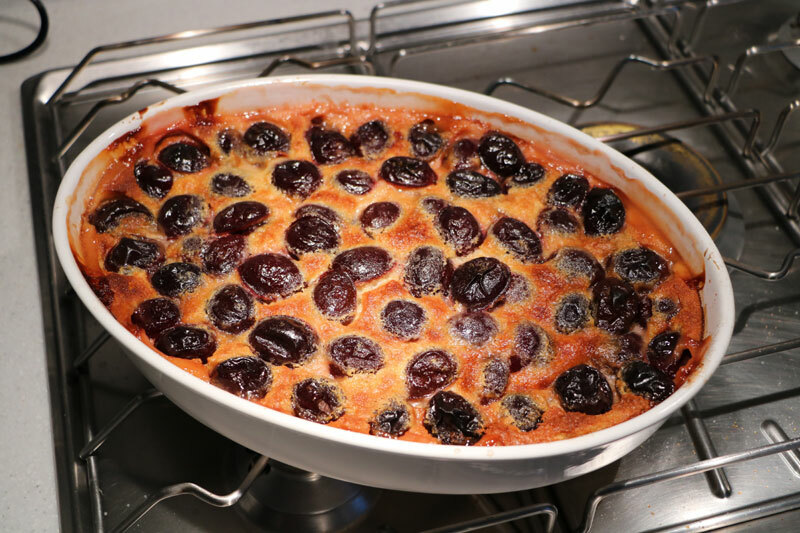 Apple and almond gratin: Apples with toasted almonds in a vanilla custard-style cream sauce. Apple Batter Puddings: Individual apple and almond batter puddings. Apricot blancmange: A medieval dessert . Apricot fool: Whipped cream (Chantilly) and fresh fruit coulis. Black Forest gateau: Chocolate genoa sponge, whipped cream and cherries. Chocolate and vanilla crème brûlée: Crème brulée in 3 layers: chocolate ganache, vanilla custard and caramelized crust. Chocolate mousse with hazelnuts: Gourmet chocolate mousse with toasted hazelnuts. Eton mess: Meringue, strawberries and cream: an English dessert,. Flaked almond tart: Tart made with toasted flaked almonds and a sweet, creamy filling with a hint of alcohol. Fresh mint ice-cream: The incomparable pure taste of mint. Frozen Nougat: Soft dried fruit nougat, smooth and crunchy at the same time. Lemon creams: Set lemon cream with fruit coulis. Like Bounty: Coconut fondant coated in chocolate sauce. Pain perdu: Bread soaked in cream, sugar and egg yolks, then fried in butter. Pistachio ice cream: The real taste of pistachio. Pistachio panna cotta with custard: Pistachio panna cotta, custard and caramelised pistachios. Strawberry, kiwi and mascarpone verrines: Halved strawberries, chopped kiwi with lemon and mascarpone cream. 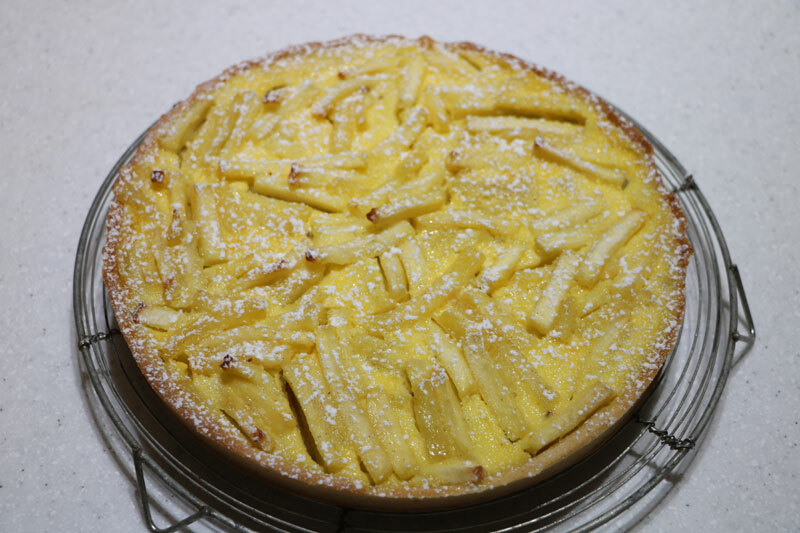 Tarte Normande: Sweet pastry case, apples sautéed in Calvados and cream-egg filling. 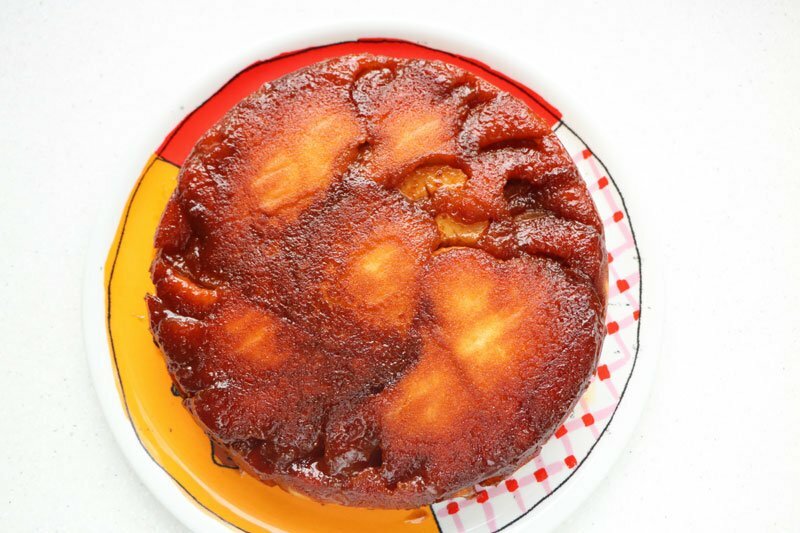 Tatin apples with mascarpone cream: Caramalized appled and smooth mascarpone cream. 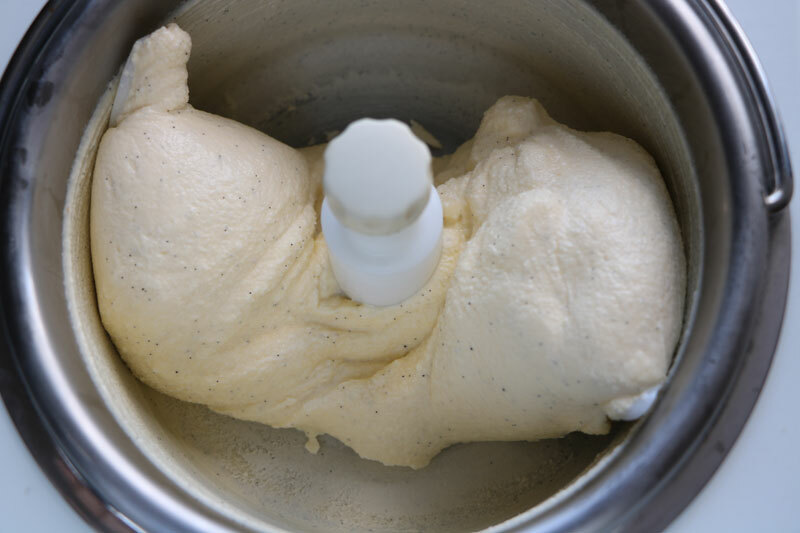 Vanilla ice cream: The real taste of vanilla. Beurre blanc sauce: Vinegar, white wine, shallot and butter. Chantilly cream: Whipped cream with sugar. Chocolate sauce: Smooth creamy chocolate. 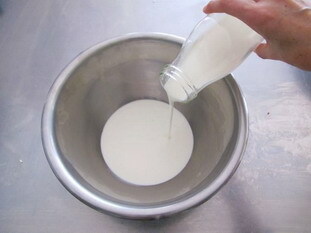 Panna cotta: Smooth cream thickened and lightly set. Pan-baked hash brown (Hash-brown casserole): Oven-baked potato cakes.